Listen to Previews for 9 Tracks off the New Street Album- Streaming Now! Preview 9 tracks off the the Burrrprint 2HD including "Coca Coca" ft Rocko, OJ Da Juiceman, Waka Flocka, Shawty Lo, Yo Gotti & Nicki Minaj & "Do This Sh-- Again," featuring Yo Gotti and Rick Ross. 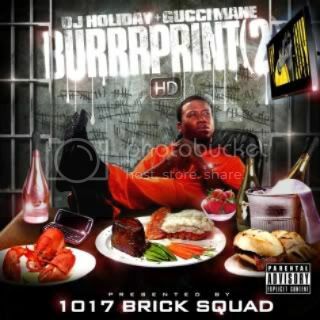 Hear all the new music & talk with other Gucci Mane Fans at the Burrrprint 2HD Fan Page on GucciManeOnline.com!